Sanatatea mintala – Prioritate pe agenda publica! 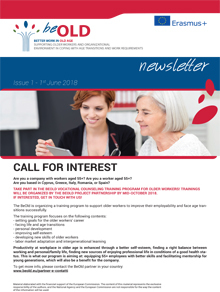 The BeOld is organizing a training program to support older workers to improve their employability and face age transitions successfully. Productivity at workplace in older age is enhanced through a better self-esteem, finding a right balance between working and personal/family life, finding new sources of enjoying professional life in conditions of a good health status. This is what our program is aiming at: equipping 55+ employees with better skills and facilitating mentorship for young generations, which will also be a benefit for the company. PARTICIPATI LA PROGRAMUL DE FORMARE – BEOLD – PENTRU MANAGERI DE RESURSE UMANE, MANAGERI, COORDONATORI, DIRECTORI DE ORGANIZATII / INSTITUTII!